Fennel came to the sanctuary from a small-scale “dairy” farm, where for many years she suffered the cycle of forced impregnation, separation from her calf, and mechanized milking until she ran dry and was impregnated again. At some point, the owner of the farm ran out of money and quit feeding the cows. They survived as best they could by foraging but, come winter, began to starve. 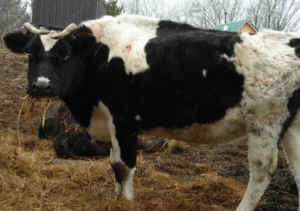 We are so sorry to report the death of the cow called Fennel on Friday. One week before, Fennel had sustained nerve damage which left her unable to stand or even lift her head. Quick intervention and sustained physical therapy led to improvement, and she was soon able to lift her head and eat on her own. However, while she was able to move her legs, she remained unable to stand. Because of the way that cows’ digestive tracts are configured, there is a danger of death every day they remain down. We lifted Fennel several times each day, to get her system moving and to give her physical therapy. On Friday, she began breathing erratically while being lifted. Cheryl lowered her immediately and then cradled her head as she died. Fennel came to the sanctuary from a small-scale “dairy” farm, where for many years she suffered the cycle of forced impregnation, separation from her calf, and mechanized milking until she ran dry and was impregnated again. At some point, the owner of the farm ran out of money and quit feeding the cows. They survived as best they could by foraging but, come winter, began to starve. Fennel and her comrades received intensive veterinary care after being seized by authorities but were still skin-and-bones when they arrived at VINE in early 2012. Cows are social mammals, living for and through their relationships with others. Fennel’s closest relationships were with the three cows with whom she arrived at the sanctuary: Blake, Rosetta, and Addison. She seemed closest to Blake, the leader of the crew, who often expressed her affection for Fennel by intently grooming her. Fennel herself was quiet and reserved, although we cannot know if this was her original personality or a reaction to the grief and trauma she endured. 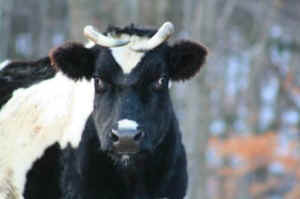 We would have liked her to have more time here at the sanctuary, to continue to become herself. We do feel glad that Fennel and her herd had a spectacular summer in the back pasture. 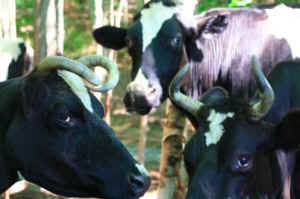 More than any of the other cows, the quartet that included Fennel love that hillside. While other cows can be easily enticed elsewhere with grain, they always linger as long as they can. Now that quartet is a trio. We can only guess what Blake, Rosetta, Addison and the other members of Fennel’s herd are feeling or how the herd itself has been lessened by her loss. We do know that Fennel’s human herd (that’s us) is hurting. Much more than the physical labor, feelings are the hardest part of sanctuary work. We are always aware, as we extend care to the animals here, of all of the animals elsewhere. What each of us feels when someone dies depends on many factors, such as the manner of death, our personal relationship with that animal, and the length of time that he or she lived happily here in comparison to how much and how long she or he suffered before coming to sanctuary. Sadness and rage are only two of the strong feelings that sometimes grip us in our grief. As animals, we are meant to be motivated by our emotions. That’s why our bodies have feelings. So, rather than grieving in private, we would like to mourn Fennel in a manner that channels our feelings into effective activism. One thing we might do is redouble our efforts to demystify “dairy,” and to do so while keeping Fennel in mind. We need help with that. Specifically, we need past examples and fresh ideas of ways to make people —and especially the mothers who do the preponderance of grocery shopping— aware of the physical and emotional pain hidden within every glass of milk, block of cheese, and bowl of ice cream. What about you? What do you feel when you learn that Fennel or another animal at this or another sanctuary has died? What do you do with your feelings about all of the animals who die by human hands every day? What do you think we could or should do to mourn Fennel or those other animals? Please share your thoughts here or on Fennel’s memorial Facebook album.